Recent public opinion data suggests that attitudes of Ontarians toward the federation are shifting. From 1998-2005, Ontarians were unique amongs Canadians in believing their home province was treated well in the federation. Today, Ontarians resemble other Canadians in believing that there are inequities in the federation that must be addressed. The implications for our national politics may soon be apparent. The Ontario public may no longer be supportive of its provincial government playing its traditional role as a consensus-builder among competing provincial interests, potentially making divisive issues like carbon pricing even more volatile. Responding to this “New Ontario” will require the federal government to adopt a positive agenda for Ontario. 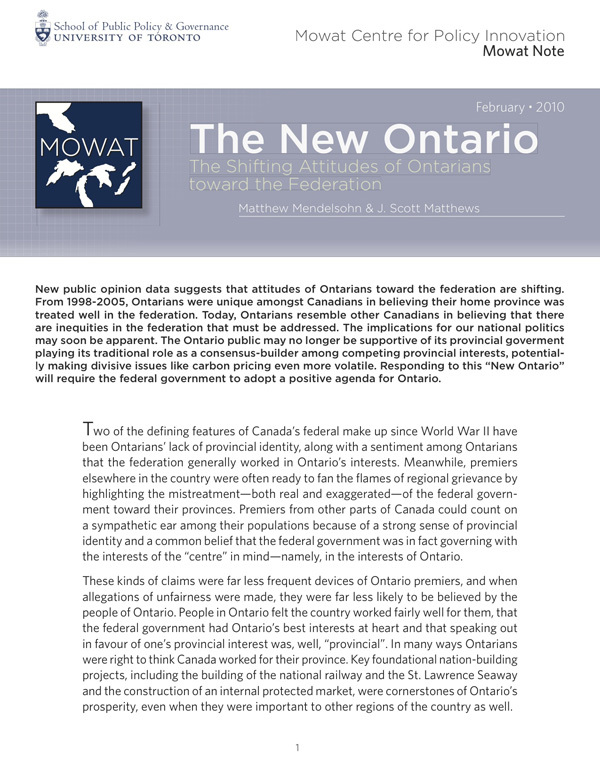 Two of the defining features of Canada’s federal make up since World War II have been Ontarians’ lack of provincial identity, along with a sentiment among Ontarians that the federation generally worked in Ontario’s interests. Meanwhile, premiers elsewhere in the country were often ready to fan the flames of regional grievance by highlighting the mistreatment—both real and exaggerated—of the federal government toward their provinces. Premiers from other parts of Canada could count on a sympathetic ear among their populations because of a strong sense of provincial identity and a common belief that the federal government was in fact governing with the interests of the “centre” in mind—namely, in the interests of Ontario.?? These kinds of claims were far less frequent devices of Ontario premiers, and when allegations of unfairness were made, they were far less likely to be believed by the people of Ontario. People in Ontario felt the country worked fairly well for them, that the federal government had Ontario’s best interests at heart and that speaking out in favour of one’s provincial interest was, well, “provincial”. In many ways Ontarians were right to think Canada worked for their province. Key foundational nation-building projects, including the building of the national railway and the St. Lawrence Seaway and the construction of an internal protected market, were cornerstones of Ontario’s prosperity, even when they were important to other regions of the country as well.